Lisa, who works in Bury St Edmunds, secured her prize by completing a review card for the Raj Mahal Indian Restaurant in Haverhill. Her review was entered into a daily prize draw to win £100 to spend with a local business. There were five daily prizes of £100 for each day of the week-long national campaign which was organised by thebestof and supported by thebestof Haverhill. Lisa, a regular visitor to the restaurant, said: “I particularly enjoy going to the Raj Mahal with a group of friends for the Tuesday night specials. They are such excellent value for money. 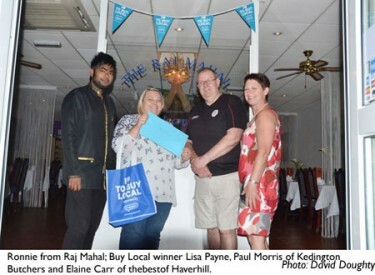 The Raj Mahal have been members of bestof Haverhill since September 2013 and have already received over 430 reviews praising the quality of the food and the service. 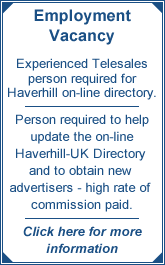 They were the 3rd Most Loved Business in Haverhill in the Local And Loved campaign run by bestof Haverhill in February this year and were in the Top 100 Most Loved Businesses in the UK. The bestof Buy Local campaign took place during the first week of June and encouraged people across the country to consider where they were spending their money and promoted the benefits of buying locally. People were asked to pledge their support to the campaign by completing a review for a local business. Elaine Carr owner of bestof Haverhill spent a day on the market promoting the campaign by giving out Buy Local bags, Buy Local stickers and flyers containing offers from bestof Haverhill business members. Elaine said: “I am so pleased that we had a Buy Local winner in Haverhill. It is good to see local people being rewarded for supporting our local economy. "I think it is also great that Lisa has chosen to spend her money with Kedington Butchers. They are a true local business, using local suppliers whereever possible. Buy Local lies at the heart of the bestof brand and is an ongoing campaign with local people still able to pledge their support for local companies by going to www.thebestof.co.uk/haverhill.